Joseph Roty has one of the largest cult followings of any small grower and has produced some of the most exquisite wines of Burgundy. His family have been producing wine since the time of Louis XIV, a staggering eleven generations since 1710. It is now run by Joseph’s son Philippe and noted for the exceptional quality of its Charmes-Chambertin Très Vieilles Vignes, which may date back to the end of the 19th century. Not much is made and even less of Mazis- and Griotte-Chambertin. 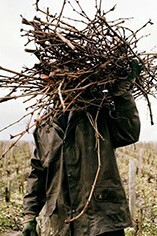 It is easier to find his 1er Cru Fonteny (0.45ha) or various village Gevrey-Chambertin and Marsannay cuvées. The wines are full-coloured and exuberantly fruity. The only time I tasted with Joseph himself, the wines were illustrated by constant illusions to different types of female. The domaine has a total of 17 acres and produces virtually near perfect Mazis-Chambertin and Charmes-Chambertin in the top vintages. Both wines are aged in 100% new oak for 15-16 months, bottled unfined and unfiltered.